The following brothers visited Shaikh Rabee’s house in the summer of 2002; Abdul Qadeer Baksh, Abu Usama ath Thahabi, Khalid Ayaz and Farasat Latif. Shaykh Rabee made clear his dissatisfaction with Abdul Qadeer (based upon the lies that had been told to him). When Abdul Qadeer clarified his position. Shaykh Rabee accepted Abdul Qadeer’s explanation but insisted that Abdul Qadir should make up with the brother in Birmingham (spubs). Abdul Qadeer said “but Shaykh, they wont make up with us. 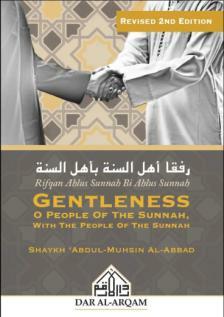 Shaykh Rabee said: “I will speak to him” to which Abdul Qadeer replied, “it is better Shaykh if you write to them”. Shaykh Rabee agreed to write a letter. He then lifted his leg up, stamped his foot on the ground and said ” if you join with them, everything I have said (about you, Abdul Qadeer), I put under my feet”. After inviting the brothers to his house for dinner, Shaykh Rabee wrote the attached letter, advising the brothers to put aside their differences and to unite the ranks of the salafis in the UK. The letter was addressed to Abdul Qadeer (Luton), Abdul Haq Baker (Brixton) Abu Khadija, Dawood Burbank (rahimullah) Abu Sufyan McDowell, and Abdur Razaq amongst other. Abu Khadija was sent a copy of the letter by Farasat Latif, but he received no reply. Farasat then phoned Abu Khadija and asked: “what do you think of the letter from Shaikh Rabee”. Following this telephone conversation, an agenda was sent to Abu Khadija. No reply. An invitation for dinner was sent. No reply. Yet, a wall of silence. No reply from the man who claims to follow the scholars. However in the meantime Abu Khadija started to spread a rumour that the letter was fake. When he realised that the letter was genuine, he said that Abdul Qadeer lied to Shaykh Rabee, in order obtain the letter. A follower of desires will never accept advice which is contrary to his desires, unless Allah guides him.